for the third consecutive year. Over 360 visitors braved the July heat to visit TVLTC's 25-foot town /train display. This year, we introduced a new play brick area so that our young visitors could enjoy some building while they looked at our displays. 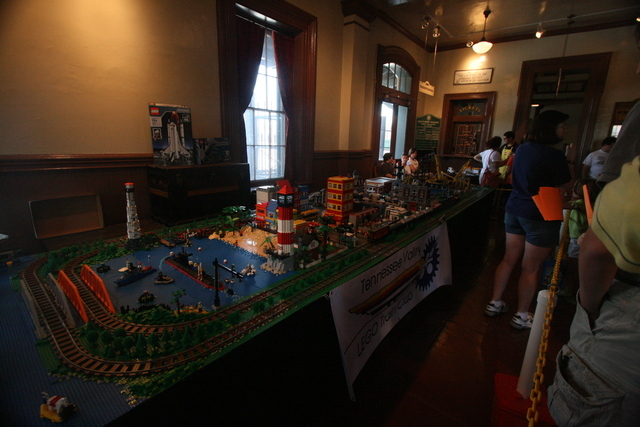 Highlights of this year's layout included a new replica of the Huntsville Depot, a beach town modeled after Santa Cru z , a Space Shuttle and launch complex, a detailed construction site combining Technic and City inspirations, and a wide assortment of LEGO trains. Pictures from the show are available on Brickshelf: http://www.brickshelf.com/cgi-bin/gallery.cgi?f=459288 Thanks to Le for serving as show photographer!